The image is 7.25 x 10.5 inches and comes in an 11 x 14 inch museum quality (acid free) mat board, backed by foamcore and shrink-wrapped for protection. 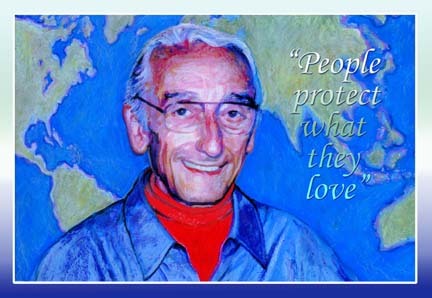 A true citizen of the world, Captain Cousteau was the perfect wave that floated and flooded our senses. He showed us that life is all connected; and when you loose one part of it, we’re all affected.